You may be confused with all the e-readers for sale. I know I am. I love to read. Wished I had a little more time to read. And I think an e-reader could help with that. My friends have the Kindle . I have played with a Nook in stores before. And Nathan owns an iPad. The one he won from a bookstore. I asked SMM’s tech expert, Nathan, to share with us everything he knows about each of the readers. I like to do research before making a huge purchase. Hopefully this will help you too. Amazon’s Kindle uses a new display technology called E Ink. The primary benefit of E Ink is that the screen looks like printed text on paper. The screen does not have any glare or reflection which makes it very readable both indoors and outdoors. The problem with E Ink is that it is slow and only black and white. Current versions of the Kindle can not show video or color images. Essentially when you change the page the screen fades to black and then fades back with the new page. The Kindle also doesn’t currently use any touchscreen technology and some people complain about the keyboard controls. The Kindle is very lightweight at about 10 once and comes in two sizes, a 6-inch screen and a 10-inch screen. Each can hold over 3500 e-books and can download new books from the Amazon bookstore in less than a minute. The Kindle comes with Wi-Fi or 3G wireless connectivity so you can download books from just about anywhere in the world. The Kindle bookstore has around 540,000 titles available including a lot of free public domain books such as Pride and Prejudice, Sherlock Holmes and Treasure Island. The Kindle can only open e-books purchased from Amazon and unprotected PDF files. Kindle books can not be shared with other people. The Kindle also supports text-to-speech which will read the books aloud to you. The Kindle starts at $139 for the 6-inch Wi-Fi version. The 6-inch version including Wi-Fi + free 3G connectivity is $189. The 10-inch version with Wi-Fi + 3G costs $379. Barnes and Noble’s Nook uses a 6-inch E Ink display similar to the Amazon Kindle. With the E Ink display you get the same pros and cons as the Kindle. 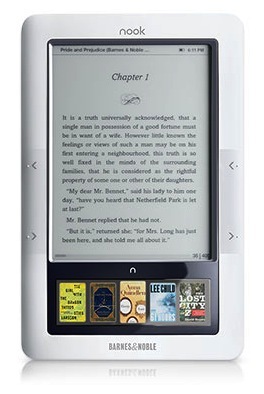 The Nook tries to compensate for the slow E Ink display by including a small color LCD touch screen below the E Ink screen. This allows for faster navigation and a better experience seeing the book covers in color. The screen also can act as a keyboard for searching and buying books. Another area where the Nook tries to differentiate itself from the Kindle is with a Wi-Fi connection. The Wi-Fi connection allows for faster downloads and also allows for free in-store reading at all Barnes and Noble bookstores. The Nook also comes with free 3G wireless data in the US. Probably the most interesting feature on the Nook is the ability to lend a book to another Nook owner. You can send the book to your friend through the Nook lending service and they have 14 days to finish the book. After 14 days the book comes back to your Nook and you can read it again. The Nook also supports MP3 files, and a number of image formats. The Nook supports EPUB format for e-books. 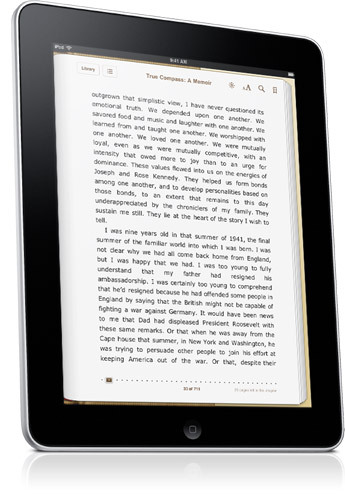 The EPUB format is also used by other e-readers except the Kindle. The Nook also supports text-to-speech features similar to the Kindle. The Wi-Fi only Nook costs $149 and the Wi-Fi + 3G version costs $199. Apple’s iPad is more than just an e-book reader. Along with capabilities for reading books, newspapers and magazines it allows for applications for email, web browsing, games, music, movies and productivity. Because the E Ink screens are slow for these other types of applications the iPad uses a 9.7-inch color LCD touch screen for interactivity. The text is not as crisp as an E Ink screen but it is readable without the eye strain most people experience while reading on a computer monitor. However, the glare from the glass screen can make it difficult to read outside. Apple has their own e-book reader application called the iBooks which can be downloaded from the App Store. Amazon and Barnes & Noble also have e-book apps for the iPad to read e-books from their bookstores. For example the iPad can read Kindle books using the Kindle app. Holding the iPad upright you’ll see a single page, holding it sideways you’ll see two pages. The full touchscreen on the iPad makes reading a natural experience. You tap the margins to change back and forth between pages or swipe across the page. The iPad supports full color images, graphics and text. You can start reading a book on the iPad and then later continue reading on your iPhone or iPod Touch. One of the ways the iPad is more interactive is through individual apps. For example, newspapers and magazines use individual apps to present color info-graphics, 360º product reviews, video interviews and custom layouts. The iPad also supports text-to-speech anywhere so it can read books and magazines back to you. A downside to the iBookstore is it has approximately 50,000 titles. Amazon and Barnes and Noble have significantly more titles. You can purchase books anywhere you have a 3G or Wi-Fi connection (depending on the model of iPad). The iPad weighs 24 ounces which makes it substantially heavier than the Nook or Kindle. The iPad starts at $499 for the 16GB Wi-Fi version and models with 3G start at $629. Some of the smaller and emerging companies include Kobo and Sony. Kobo is a software platform which has partnered with Borders to provide e-reader hardware and software. The Kobo is very similar in features to the Barnes and Noble’s Nook. Sony also has three e-readers which use E Ink displays and you can buy books in the Sony bookstore. The Sony e-readers are similar to the Amazon Kindle. The Kindle and the Nook show that E Ink technology is becoming more mainstream and are now available starting at $139. The iPad is a premium product and is more of an ultra-portable computer with e-book functionality that starts at $499. If you are looking to jump into the e-book market and are on a tight budget then the Kindle is the way to go. I haven’t talked to anyone with a Kindle that didn’t love it. However, if you are looking for a little more functionality and interactivity then the iPad is going to be the right choice. It provides an amazing experience and allows you to read books from any platform. » Tell me… Do you own an e-reader? Are you thinking of getting one? Which one do you think will work the best for you? I have a Nook and I love it. I’ve found I read a lot more since I got it, and the ability to download samples of books to preview before I buy them is an added bonus. We also installed Barnes & Noble’s e-reader software on my husband’s Droid phone so we can share books. I LOVE LOVE LOVE my NOOK!!! I adore my kindle! I use it very often, and a nice plus is that I can download free classics through feedbooks.com. I’m also a big crocheter, so if I find a free pattern I just turn it into a PDF and can take it with me everywhere. that’s awesome that you can take your crochet patterns with you on kindle. so mobile! We have a nook and love it. The touchscreen at the bottom makes it very easy to browse and get to what you want. The best thing is that our library has an extensive collection of e-books and the nook supports that format. We haven’t paid for a single book in six months of using it! Oh, how I want an e-reader! I really can not decide if I would prefer a Kindle or a Nook. I’d recommend the Kindle over the Nook especially as the new Wi-Fi only version is now just $139. The only caveat is that you are basically locking yourself into the Kindle book format. I love my iPad. It is so much more than a reader and since I am on the go alot it really helps. Almost forgot, I have a giveaway over at my blog http://aspoonfulofdish.blogspot.com come and check it out. I can’t tell you how much I love my Kindle. It was a Christmas gift from my mother this past year. We even share an account so I have access to the book she reads and vice versa. It works for us because she buys my books and I send her items from Costco she can’t get in Kentucky. My favorite part of my Kindle is if I’m in the mood to read a particular kind of book it is there in minutes. I would like an ebook reader that has the text to speech or read to me feature.. while I am at the sewing machine I like to listen to stories and podcasts. Any suggestions? All of the e-readers (Kindle, Nook and iPad) can read books aloud. The iPad does a much better job with podcasts as it has all the features of an iPod. any idea if the nook OR kindle read aloud? All of the e-readers (Kindle, Nook and iPad) can read aloud. I’ve updated the post with that information along with some information about the new Amazon Kindle announced yesterday. My mom has a nook and absolutely loves it! I myself have used it and the touch screen is easy to use, and surprisingly doesn’t get covered with fingerprints as you would imagine (but she does have a protective film covering it). It has been nice to use the internet using the wireless internet to surf the web as well. And she has not yet paid for a book to put on it because we can upload e-books from our local library. This might be a silly question– but what does it mean to be “locked in” to the Amazon format w/ the Kindle? I’ve really been wanting an e-reader, and hope to make my purchase within the next couple of months. I’ve been using the Kindle for pc software & the Nook software on my netbook. It has been working nicely for me since I already owned the netbook.